We’ve heard many reports from Americans returning from Spain that are appalled by the blood and violence of bullfighting. To be honest, this didn’t turn me off. In fact, I was originally excited that our stay in Sevilla, arguably the bullfighting capital of Spain, straddled a Sunday night when bullfights traditionally occur. It was our misfortune that this fall’s Novillos (amateur bullfighters with young bulls) were rescheduled for the first time from Sunday to Thursday nights. Still anxious to get a taste of this facet of Spanish culture, we decided to spend an hour at the museum at Sevilla’s Plaza de Toros de la Maestranza. Bilingual tours are offered 3 times per hour for €6.50. The tour offers a glimpse at the inside of Sevilla’s Plaza de Toros, which is still a great photo op, even when empty. 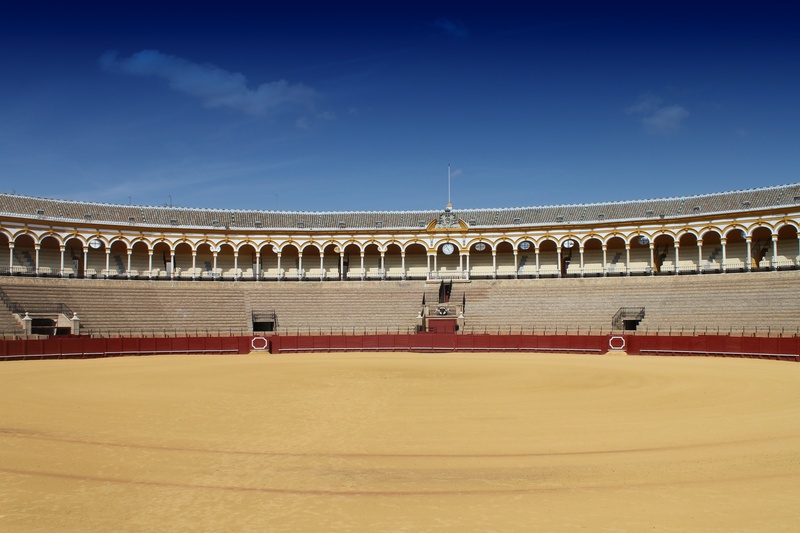 We thought the tour was well worth the time and investment, and certainly gave us a good introduction to bullfighting history, as well as some “basics”. In fact, we both discussed that we would recommend a visit to the museum to even those planning on attending a bullfight. The material covered in the tour would no doubt give spectators a better appreciation of the sport. We had no idea that bullfighting involved more than just a matador, his cape, and a sword. The tour guide walked us through the traditional stages of a bullfight. First, the bull is released into the ring and taunted by one of the matador’s assistants. The matador watches closely to understand the bull’s behavior. Next, a pair of picadores enter the bullring and drive a lance into the bull’s back to weaken the bull’s neck muscles. Finally, the matador himself enters and uses a collection of capes and a curved sword to kill the bull. The president of the bullfight determines if the matador performed well, and awards him with the ears or tail from the bull. For more information, Stars and Stripes has an excellent overview. During the description of the sport and sights on the tour, we were very impressed with the annunciation of our tour guide. We both took many years of Spanish in school, but always had difficulty understanding locals on our trip. During the tour, we almost felt like we didn’t need the material to be repeated in English, because the Spanish of the tour guide was so easy to understand. I can’t confirm that other tour guides have this quality, but we certainly appreciated it in ours. It made it an even more memorable experience. Stops on the tour include access to the stands of the bullring, a collection of bullfighting artwork, a chapel, stables, and 3 rooms that step you through the history of bullfighting with various artifacts. Visitors are allowed just enough time to peruse what’s on display. 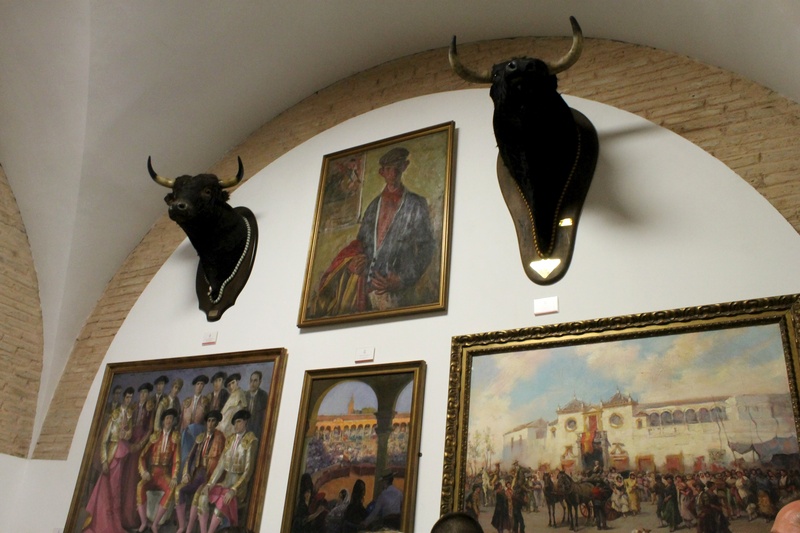 The tour goes through three rooms in the museum that step through different periods of bullfighting with various artifacts. We would certainly recommend the museum tour to any visitors to Sevilla. It offers a very unique experience not available elsewhere. 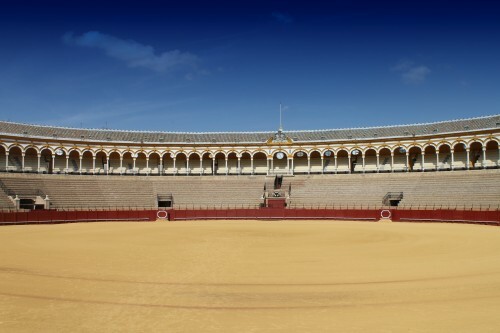 It offers both an opportunity for experiencing the bullfighting tradition for those that object to the violence of the sport, and a great introduction for visitors that plan on attending a bullfight thereafter. This entry was posted in Travel and tagged Europe, Portugal/Spain 2012 Trip, Sevilla, Spain by Ryan. Bookmark the permalink.